Once upon a time I found it, in a place in Rome, a stout hearted young woman who spoke no English dedicated herself to making my feet young again – baby soft. It was like walking on air, for at least a day. But now, sadly, that place has closed down – and the search begins again for the perfect pedicure. but I suffer from a truly heinous build up of dry skin, which makes small children wonder “what is wrong with your feet” and adults look away in horror. But first I have to find the perfect pedicure. I have come close… The Cowshed in Carnaby Street is a fab place for a pedicure, as they have a row of chairs, so you can enjoy a pedicure with a friend. It certainly made me think I had found the best in London (although it didn’t quite match up to the one in Rome). But a second trip and a more surly therapist and the search was on again. My search also led me to the Bliss Softening Socks which promised so much, but sadly fell short. …to a generic New York nail bar round the corner, which was fun, but not even close. I’m sorry to say that even IMBS in Balham wasn’t a contender, because theirs is a standard pedicure - not the super human kind that I need. In fact I often have to give myself a pedicure just so I can show up for a pedicure without scaring them. is the luxury pedicure at Another World. Although it doesn’t quite get rid of all that stubborn hard yellow skin on the soles of my feet, it does get rid of all the dry skin and make them look pretty, which is a big step in the right direction! 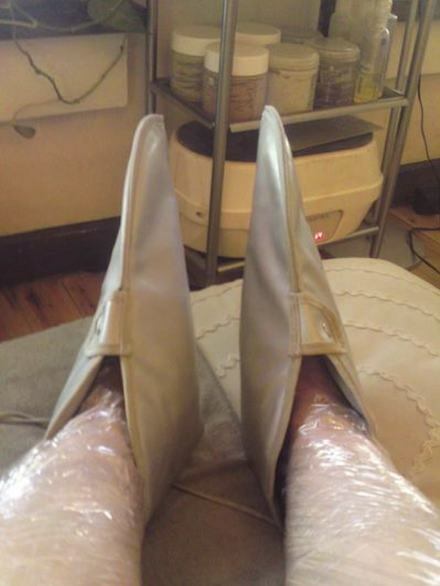 I have leads on a few more promising treatments… including the widely renowned Garra Rufa Fish treatment where doctor fish nibble your toes, which I’ve just tried - but I think I’ll need a lot more treatments to make a difference, so the jury is still out. that I have found is the Scholl Instant Hard Skin Remover. After a good scrub with this, even my hard skin is gone, and then I can slather on the foot cream and relax... and book in for a gentle pampering pedicure.